I know you wanted to limit discussion to straight keys, but some time ago I did both some calculations and measurements on different paddles - comparing Vibroplex with a Begali Magnetic, Signature and Contour paddle, for example. 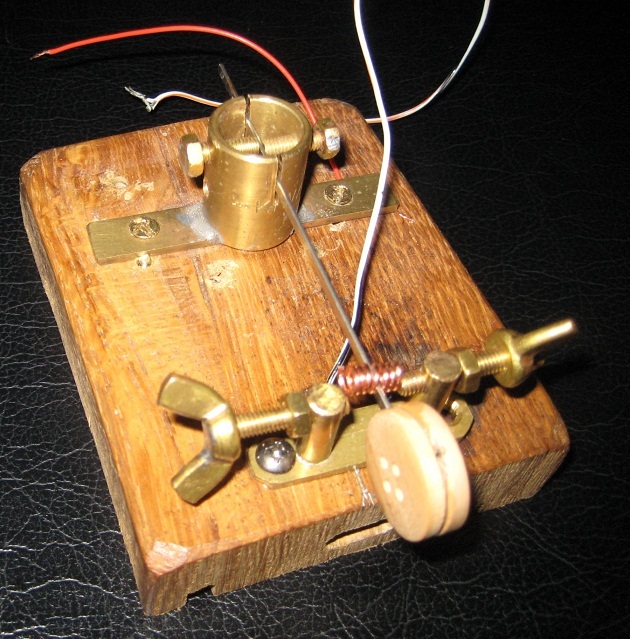 I had some correspondence with Ulrich Steinberg, who designed some of the Begali keys. Below is one of the messages I sent to Ulrich. 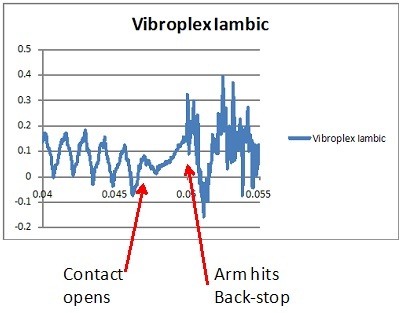 Ulrich also pointed out that arm resonance and vibration might be another issue to consider, which I did not. I calculated the moment of inertia of different paddle arms. My conclusion was that for fairly high speed CW sent on a paddle (say 40 wpm and more), the moment of inertia and angular momentum of the paddle arm was beginning to become quite significant, and that it was worth choosing a lighter, shorter paddle with the pivot near the center of the arm. Based on the calculations and measurements, I chose to purchase a Begali Contour paddle, and have not regretted that. I'm not sure that would be relevant to a normal straight key, though, simply because straight keys are normally used at slower speeds. First, taking one arm of the Vibroplex Iambic, I calculated its Moment of Inertia (MI) about its pivot point, using its physical dimensions and using the density of steel. I then took the moment involved with 10 gm of force (corresponding to the return force on the paddle - this is how my Vibroplex Iambic is currently set) on the end of the paddle, and calculated the time it would take that given MI to accelerate and rotate an angle equivalent to 0.03 mm (my contact gap) at the pivot distance of the contact. This came out to about 3.1 milliseconds. In other words, after the paddle is released, this is how long it would take it to return to its normal rest position. Now, given that even at (say) 40 wpm the length of a dot is 30 ms, this is already about 10% of a dot length. So, the first conclusion is simply that angular momentum isn't entirely negligible. I'm ignoring friction, which would make the time delay even greater. To see if I'd got my sums roughly right, I did a simple experiment. I measured the time between the end of the tone from an electronic oscillator, when the contact on the Vibroplex was released and opened, until hearing the noise of the arm hitting its back stop. This is a measure of the time it takes the paddle to return to its rest position. This is just what I tried to calculate above. I just used a microphone and oscilloscope to pick up a continuous tone from the keyer until it stopped, and to detect the arm crashing into the back stop afterwards. What I measured (see the figure) was a delay of about 2.9 milliseconds. Now, since I'm using sound, you have to take into account that the microphone was only about 1 cm from the key back stop, while it was about 16 cm from the loudspeaker of the keyer. That means the tone from the keyer is delayed relatively by about 0.5 ms before it reaches my microphone. Adding in that correction, my best estimate of the measured paddle arm transit time becomes 3.4 ms. There are so many assumptions and possible errors here that the fairly good agreement between 3.4 ms and my "theoretical" 3.1 ms is certainly fortuitous, but might indicate about the right order of magnitude. Now, what I've calculated and measured probably isn't all that relevant. However, the same numbers will work when the key is being closed with your finger. If your finger applies a continuous 20 gm of force (overcoming the return force of 10 gm by a further 10 gm), then it will take the same ~3 ms for the contact to close. Of course, in normal operation the finger probably applies a lot more than that. However, the time only reduces as the square root of force, so it means you have to work quite hard to reduce that 3 ms significantly. Alternatively, for a given force, the time only reduces as the square root of MI, so the MI of a paddle arm has to be reduced by quite a lot to make a difference. Looking at the Magnetic Classic (or the Signature) paddle, I'm guessing that the arm mass is less than half that of the Vibroplex. The total length of the arm of the Magnetic is comparable to the Vibroplex, so it's "just" the thinner arm of (?) lighter material that's helping. Nevertheless, the time to close a contact with a given force only changes as the square root of the MI. Looking at the Contour however, the total length of arm L contributing to the MI might be only half as much. So, all other things being equal, the contact opening time I calculated would become less than 1 ms, and the finger pressure needed to close the contact in a given time would be quite significantly less. many thanks for the interesting information and for the kind advertising in PLL Nr. 401. 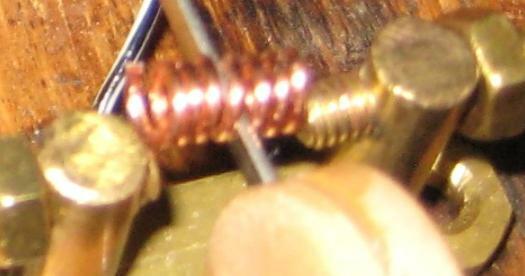 BTW, I am a huge fan of 0.4-mm wire for antennas I used that wire for a carolina windom in the garden 28m long, up 8m. It lasted 5 years, and then I moved house and installed it in the new garden. After 2 years, I moved house again, and that's why I had to take it down at the end (no garden in the current QTH). In the first two years, I had a fishing line (nylon monofiber) in parallel to the copper wire: for strength, I thougth. But after a while, the nylon line deteriorated in the weather, and the copper wire was still fine.
" November 29, 1847 Michigan's first telegraph line is completed along the Michigan Central Railroad tracks between Detroit and Ypsilanti. The first messages sent are long and range from the price of wheat and putty to news of the Mexican War. Eventually the line will extend to Chicago and be used by the Michigan Central to dispatch trains. " Anybody know of a place to get J38 parts? I need one of the screws that holds the wires in the hole. Not all of me will die - - - The good I do will live forever. Also Mouser in Ft. Worth, TX has a large collection of thumb screws. Hopefully a related question, on my J-38 the the lever has some side to side movement. Would that be cured with new trunnion screws ?? Can't you add any tension to the pivot by tightening the two side screws and locking them down ? Tried that and if I tighten to the point where this is no wobble, then the lever won't move. I was guessing that the ends of the trunnion screws are worn. I find them at lamp shops and at ACE hardware. They have Brass or Nickle/Chrome. and tried a similar type of antenna, a sort of triangular arrangement for multi-bands, but could never get it to work well on all of the bands. I did wonder about using the wire as a multi-nested dipole. I might dig it out and try again sometime. This is the antenna I bought from a company called Sandpiper Antennas, they don't seem to stock it anymore, but the article explains the theory. As I say, I gave up trying to get it to tune properly on all of the bands advertised. Maybe it was too close to the ground, or the house/hedges? I have one; works great on 20 thru 10. I saw your list of SKCC new members and would like to join myself. And start seeing the code everywhere. It's a ditditdit dah dahdahdah ditdahdahdit sign now. Not a Stop sign. Here's my new WSW cootie (WindShieldWiper cootie). This last weeks I had to change one of my car's windshield wipers. I discovered two steel strips in the old windshield wiper and the idea for this cootie was born. The steel strips are very flexible, so I had to find out about the optimal distance between the post and the contacts. ​So I first made an experimental cootie, just build with scrap from the junkbox. The experimental key has a good action, so I decided to make another one. But now I wanted to have an adjustable flexibiliy. So I made a slider with an clamp (like the Maniflex sideswiper). For the time being I'm using a coiled contact, mounted on the steel strip. I have to find out witch contacts are the best for my way of keying. Don't like to have the contact directly on the steel strip. Cars seem to be a good source of parts for making cooties but don't take your Rolls-Royce to pieces. Durk, I have 14 different Ferrari .... "Burago"